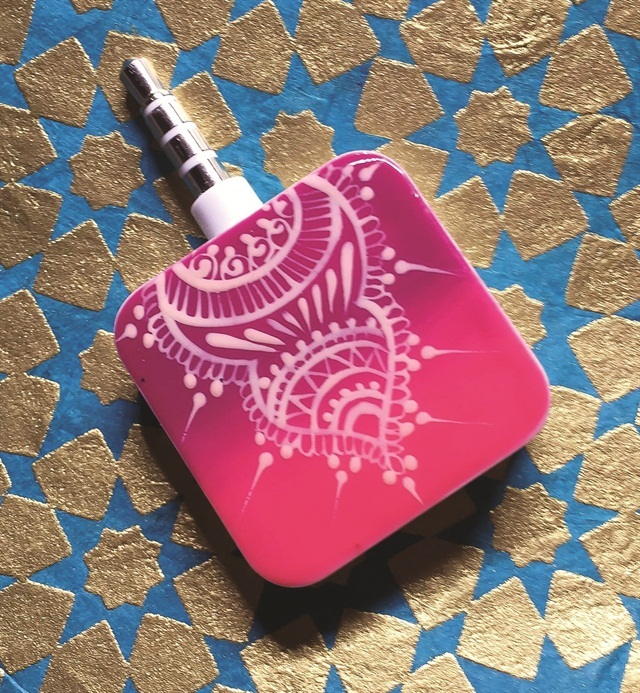 Spruce up your Square reader with the help of Young Nails senior mentor Sabella Snyder. 1. Buff the flat side of the Square reader with a coarse buffer. Since it’s plastic it needs the coarse texture in order for the gel to stick properly. 2. Cleanse the surface with your cleanser of choice to make it dry. 3. Apply one coat of Protein Bond. 4. Apply base gel and cure. 5. Have fun creating any design you would like. Snyder did a two-tone ombré with gel and hand painted henna designs. Be sure to cure after artwork is complete. 6. After curing, apply Gloss Synergy Gel as a top coat and cure for two minutes. Since this top coat is hard gel it will make the design durable and stay shiny.